The Classic Jean is NOT a stretch jean. Made from heavy-weight, 14 oz. 100% Premium Cotton Denim, this jean is Stonewashed and RELAXED Fit, with straighter legs, for Style and Comfort. 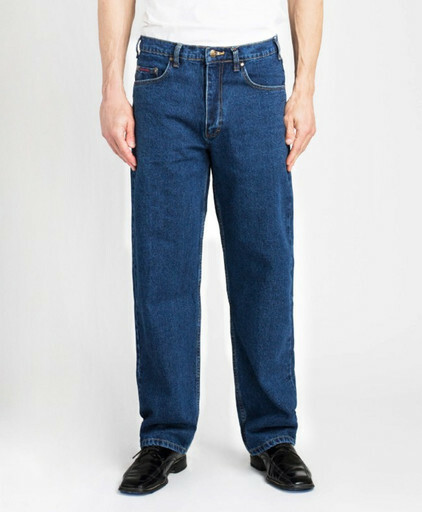 The Classic Blue Denim Jean is also customized with extra belt loops for improved fit, and features pockets that are much wider and deeper than the average jean. Even the zippers themselves have been designed for a longer lasting life. The rise in each pair of Grand River Jeans is customized and constructed to provide the best fit and comfort for each particular size and inseam length. This is especially important for maximum comfort in big and tall sizes.